What is poststructuralist theory, and what difference does it make to literary criticism? Where do we find the meaning of the text: in the author's head? in the reader's? Or do we, instead, make meaning in the practice of reading itself? If so, what part do our own values play in the process of interpretation? And what is the role of the text? Catherine Belsey considers these and other questions concerning the relations between human beings and language, readers and texts, writing and cultural politics. Assuming no prior knowledge of poststructuralism, Critical Practice guides the reader confidently through the maze of contemporary theory. It simply and lucidly explains the views of key figures such as Louis Althusser, Roland Barthes, Jacques Lacan and Jacques Derrida, and shows their theories at work in readings of familiar literary texts. Critical Practice argues that theory matters, because it makes a difference to what we do when we read, opening up new possibilities for literary and cultural analysis. Poststructuralism, in conjunction with psychoanalysis and deconstruction, makes radical change to the way we read both a priority and a possibility. 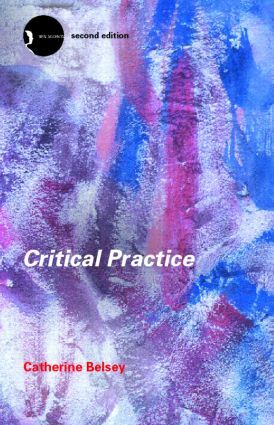 With a new chapter, updated guidance on further reading and revisions throughout, this second edition of Critical Practice is the ideal guide to the present and future of literary studies. Catherine Belsey is Professor of English at Cardiff University, where she chairs the Centre for Critical and Cultural Theory. Her books include Desire: Love Stories in Western Culture and Shakespeare and the Loss of Eden.